Following our hotly debated story about the new-look interiors for fast-food giant McDonalds in France, here’s a revamped outlet for rival Burger King in Singapore that's designed to imitate a garden. Like McDonalds, Burger King want to appeal to families with children as well as to teenagers, so commissioned design collective Outofstock to update their restaurants. The Burger King Garden Grill features a plant-covered trellis ceiling, exposed brick walls and plant-pot pendent lamps. The dining area is filled with stick-back chairs more usually found in English kitchens and metal-framed wooden dining tables inspired by camping furniture, while sofas upholstered with outdoor fabrics line the walls. Posters advertising food are displayed in pictures frames propped up on wooden shelves. More restaurants incorporating the new design are scheduled to open in Singapore and Japan in 2012. Other designer updates to fast-food restaurants include a Little Chef outlet by Ab Rogers and a chicken shop in Munich by Ippolito Fleitz Group. 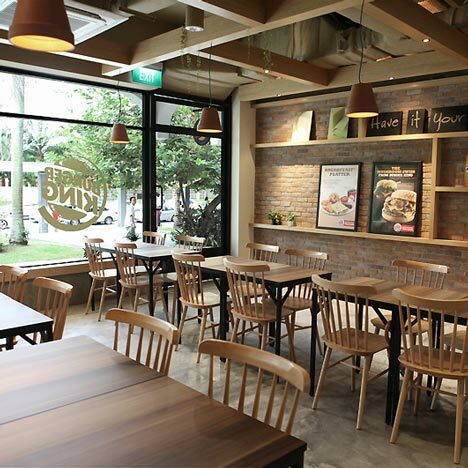 Burger King Asia-Pacific recently commissioned Outofstock to design a pilot restaurant in Singapore. The goal of the project was to create a new interior identity for Burger King. Some key points mentioned by BK was that they wanted a warm and welcoming store that would appeal to a wide audience - teens, young adults as well as families with children - the design should stand out but at the same time be accessible for the man on the street. We started off by analysing the BK brand, it's advertising visuals as well as its history. We noticed that one word that kept popping up was "flame grilled", and we used this clue as a starting point. From collective experiences, our mental picture of flame grilling is closely associated with garden barbecues and camping cook-outs. These activities, often held with groups of family and friends, left indelible memories in our growing up years. This led us to name the project "BK Garden Grill", which is based on bringing the garden, as well as colours and textures of the outdoors into the restaurant. We wanted to remind people of the joy of communal dining with family and friends in a warm and natural atmosphere, evoking memories of BBQ parties and summer camps. We also aimed at created a more personable and flexible space, where potted plants can be neatly arranged or randomly placed on wooden ledges along exposed brick walls and glass windows. Framed marketing posters placed on these wooden shelves can be changed or moved about easily. More objects can be added to the fray with time as the restaurant develops its own story. Custom designed lounge seats and ottomans are upholstered with outdoor fabrics that are water repellent. The lounge seating area is set against a collage wall of materials and textures, most of which are applied throughout the restaurant, from raw concrete to clay bricks, wood veneers as well as cork, blackboard, copper and brass. BK's branding and slogans can be applied in a more engaging way with this material wall. An overhead "roof" trellis takes visual attention away from exposed services such as air-conditioning and kitchen exhaust trunking while also acting as cable trays for pendant lamps and spot lights. We suspended clay, concrete and aluminum pots as pendant lamps to add to the garden atmosphere. We designed simple metal framed tables whose structure is reminiscent of foldable camping furniture, but being very strong and easy to clean. We sourced for a traditional stick-back chair to complete the look of the restaurant. The pilot store was officially opened during the recent BK Asia-Pacific Conference in Singapore and was met with generally positive feedback. More Burger King outlets based on our "Garden Grill" concept are currently being built in Singapore and Japan, and will be open by early 2012.